Generally, I write from the point of view of my hero and heroine, but in Convincing Lina I included the villain’s point view throughout the story. I know it’s kind of creepy to write this, but I really connected with the villain in this story. I hope you enjoy the excerpt. “He watched Lina from his concealed vantage point in the dense forest cover, as she entered the condominium unit and closed the door. It was too dark for him to distinguish the color of her dress, but there had been enough light to showcase her curves. She’d matured into a beautiful woman. His body pulsed with pent-up need. He took a deep breath reminding himself that she would be his soon. Anger coursed through his veins when the man, probably a date, dared to touch her skin. He would punish her for allowing another man to touch her. She belonged to him. She was a beautiful woman and he loved watching her. But watching her savor that man’s kiss had fueled the barely contained rage tunneling through his veins. She shouldn’t let any man touch her. He hated knowing other men had touched her. He hadn’t seen her with this man before tonight. He could feel the predatory energy surrounding this new man. He’d lingered after Lina entered her house, instead of getting into his car and driving away. Now he was in there with her. This guy would be trouble. Lina sang when she was happy. He’d left his favorite look out point to conceal himself on the balcony because he wanted to see her face when she discovered his gift. Her voice had carried through the kitchen window that she never closed, smooth and soulful like the woman herself. She hadn’t sung in a long time. Balling his fist in anger, knowing that this guy made her sing fueled his rage at not having her. He cracked the knuckles on each hand. He must remain focused. He’d watched her for months, planning for this night. His plans had been ruined by this man who looked like a businessman, but moved like a trained killer. Only he was supposed to hear her cry out at the message he’d left on her bed. No one else. His chest filled with joy at her screams, that’s how he missed the initial banging on her front door. He had barely gotten back to the parking structure underneath her unit when he heard the larger man’s voice through the kitchen window. 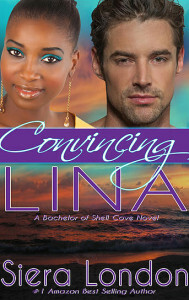 Excerpt from: “Convincing Lina” by Siera London.